Very few enterprises today are able to detect active advanced attacks quickly enough to prevent significant damage. Despite investments in security products and SIEM systems, security and incident response teams find themselves overwhelmed by alerts and unable to piece together evidence of campaigns until attackers have had days or weeks to operate. 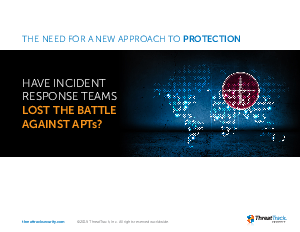 Download this eBook to learn how ThreatSecure can detect active advanced attacks and help increase the effectiveness of security and incident response teams.